The Midterms Aren't Over Yet in Florida and Georgia. Here's the Latest on Three Key Races. Although it’s been three days since the midterms ended and results were announced, the race isn’t over for key positions in Florida and Georgia. 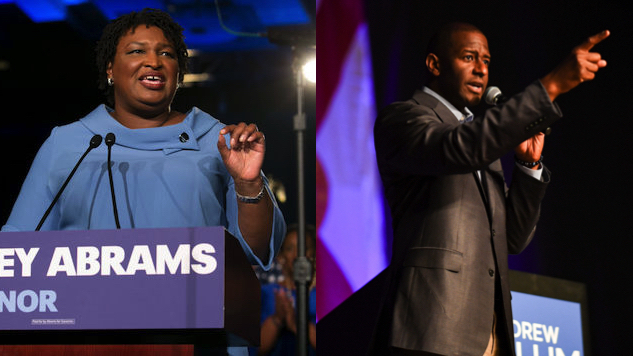 Long before voters headed into their polling places, the nation had its eyes on Andrew Gillum and Stacy Abrams. Both black gubernatorial candidates hoped to make history on Nov. 6. They’ve needed more than a little patience, though. Gillum and Abrams have dealt with problem after problem, including voter suppression, potential voter fraud and even a corrupt opponent running their own election. It’s a mess, but here’s what’s going down in Florida and Georgia’s midterms. Current Governor Rick Scott is facing Sen. Bill Nelson in Florida’s senate race, but the votes are still being counted. The margin is still pretty tight, even nearing recount territory. When that was pointed out, Scott got angry. He saw that he may actually lose his race if additional votes didn’t go his way, so he filed a lawsuit against election officials in Palm Beach and Broward Counties. From the stairs of his governor’s mansion, Scott accused Democrats of attempting to tamper with election results, saying that “unethical liberals” are trying “to steal this election from the great people of Florida,” per ThinkProgress. Whether he likes it or not, though, Florida’s senate race could be seeing a recount. Election officials might reach that point faster if they didn’t have to worry about a lawsuit. Gillum conceded to his Republican opponent Ron DeSantis late Tuesday night as his odds looked grim. More support rushed in later, though, to the point that Gillum and DeSantis were within 0.5 percent of each other. That number just happens to be the threshold for an automatic recount in Florida. Gillum rescinded his concession and demanded that every vote be counted. Election officials have yet to announce how many more votes remain before the final numbers are in, but Gillum may still have a chance. It’s possible that he could win the election outright, or, if the margin stays under that 0.5 percent, he could scrape by in a recount. Mr. @FLGovScott — counting votes isn’t partisan — it’s democracy. Count every vote. Abrams stands to be the first black woman to be elected governor in the United States; she just has to make it past her slimy opponent, Brian Kemp. We’ve covered Kemp in the past, and his campaign strategies are more than suspicious. Until he stepped down on Thursday, he was Georgia’s Secretary of State, which meant he was overseeing his own election. While he held that position, he purged 100,000 names from voter registration lists, targeted minority voters with exact match laws and even accused Democrats of hacking the election, despite having no evidence. Some think the opposite may be true. A federal judge recently demanded the reexamination of provisional ballots in Georgia’s gubernatorial race. These are the ballots submitted by anyone who might have been the victim of voter suppression at the polls. They’re only given to those who aren’t able to prove their registration status at time of voting, and aren’t even looked at until after the election. Only then do officials decide on a case-by-case basis which ones should and shouldn’t be counted. The judge is suspicious that there may be an dramatic increase in provisional ballots in comparison to previous elections. If those suspicions are proven true, Georgia may have to wait even longer to find out who will serve as its governor. In a similar situation to Gillum’s, Abrams has not conceded, and is hoping she’ll have an opening once all votes are counted and those provisional ballots are looked at. Per Georgia law, if neither candidate receives 50 percent of the vote, there’s a mandatory runoff. Last time the numbers were updated, Kemp had a wobbly 50.4 percent. If that shakes down by less than half a point, Abrams and Kemp will be on the ballot again come Dec. 4.